Faculty participating in teaching geriatrics to students, residents and fellows come from all over the Miami Valley and are affiliated with local area hospitals and institutions. 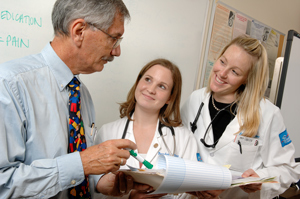 Most faculty members in the Department of Geriatrics hold joint faculty appointments in other clinical departments within the Boonshoft School of Medicine. Other participating faculty members are from the university in related areas, such as the College of Nursing and Health, the School of Professional Psychology and the Departments of Social Work, Sociology, and Biomedical, Industrial and Human Factors Engineering. All are helping advance education and training experiences in geriatrics. The principles of geriatric medicine are integrated across the medical school curriculum, especially in the Introduction to Clinical Medicine course that is delivered in the first and second year and in the third-year Family Medicine Clerkship. Other courses during Biennium I, such as neuroscience, pathology and pharmacology, also address the effect of aging on the structure and function of the human body. Biennium I students also have the opportunity to participate in service learning activities that involve older adults. One such opportunity involves work with the local Alzheimer's Association on its helpline or assisting with the Early Stage Alzheimer's Disease Support Group. Another is an ongoing Fall Risk Reduction Program in collaboration with senior centers in the Miami Valley. The Family Medicine Clerkship experience includes a supervised home visit to an older adult during which the student does a comprehensive assessment of cognition, mood and functional status and evaluates the appropriateness of the person's medical regimen. A fourth-year elective in geriatrics is also available. Family medicine residents spend time with geriatricians and geriatric nurse practitioners doing ambulatory geriatrics as well as home visits. The residents also visit a number of agencies and organizations to learn more about community resources, such as the Area Agency on Aging, the Alzheimer's Association and Adult Protective Services. Residents in other areas of training are welcome to participate as well. The education of community physicians, other health care professionals and the general public on issues relating to the care of the older adult is one of the integrated goals of the department. Visit the CME calendar for upcoming CME opportunities.